This cage comes complete with feeding bowls and perches, bird safe door openings and the cage is oven baked and powder coated in non toxic paint.. 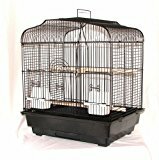 This entry was posted in Birds and tagged Bird, Birds, Black, Budgies, Cage, Canaries, Parakeets by One Boutique. Bookmark the permalink.